The dread of mockery has bobbed the world of the contributions of many people all through the ages. The great inventions that we have today are products of courage, creativity and bravery. They are Victories against mockery. There are people, who are always around to tell you that you are not good enough; they laugh at you when you start to do exercises, diet or promote safe driving habits that could save your life and that of others but the truth is that you can do anything whether it is stopping to smoke or achieving a record breaking feat; you should disregard people who belittle your efforts or attempt to derail you. They are cruel mockers and in most cases they have stopped people with their treacherous mockery. Sanballat the Horonite, Tobiah the Ammonite official and Geshem the Arab made dangerous attempts to stop Nehemiah using mockery, hate and physical attacks. Sometimes these people step up to take physical actions to stop you like they did to Nehemiah and the Israelites. 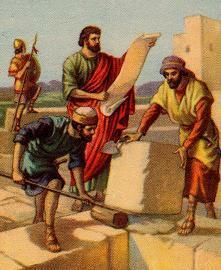 ”But Sanballat and Tobiah heard that Jerusalem’s walls continued to be repaired. The Arabs and some people from Ammon heard the same thing. Some men from Ashdod heard about it too. They heard that the gaps in the wall were being filled in. So they burned with anger. All of them made evil plans to come and fight against Jerusalem. They wanted to stir up trouble against it.” Neh.4:7-8 (NIRV). What should be your attitude to these people, their bad words and manners? Pray, be courageous and keep focussed. Let God be your source of strength and your recourse for help. Confess your faith and draw strength from the word of God. You must know that many other achievers had the same trials and overcame them. You must not surrender your initiatives. You are not responsible to them. Stay away from people who mock and undermine you, people who constantly trample on your self-esteem. They are horrible destroyers. It doesn’t matter who they are. God doesn’t want you to be treated that way. These are same people who will be first called when you succeed; they come around to enjoy the fruit of your labour. They will tell you “we know you are going to make it”. They are profuse liars whose words should not be regarded. Don’t be trapped by cruel mockery and people who delight in them. You must be careful; there are times when people indulge in this evil without knowing exactly the harm they are doing. This does not reduce the danger it causes. You must learn to define your purpose and diligently pursue it.